Toronto Mike'd is back for a 22nd episode from our new and currently unsponsored studio. In this episode, Rosie and I start things off with a frank discussion about the cease and desist letter sent by Brian Burke's lawyer followed by lighter fare, like the closing of their University McDonald's, raw food, texting protocol and their mutual love for hot dogs. This episode is exactly 44:26. Sounded amazing guys, and full of interesting content. To steal a line from "Team America", "I like you, you have balls - I like balls..."
Corefusion: Are their servers located 100% in Canada? I was looking for a hosting company a while ago for someone who had this requirement. None of their data could be stored outside of Canada. Couldn't find a good hosting company that had all their datacenters in Canada. Studio naming rights: How much? What's the opening bid? All of coreFusion's hardware, infrastructure and staff are located in Toronto. We do have some customers who store some back up data on Amazon's S3 service which is based in the US North East, but that is a choice of theirs. We have a number of customers that specifically want 100% Canadian, or in some cases, NOT in the US hosting. Feel free to contact me directly at pete (dot) mcphedran (at) corefusion (dot) com if you have any other questions. As for the studio naming rights, I'd love for all serious bidders to shoot me an email. I have a dollar figure in mind, I'd just rather not publish it here. @Mike: I think you should do more than a sealed bid. Take in bids, chose your top contenders. 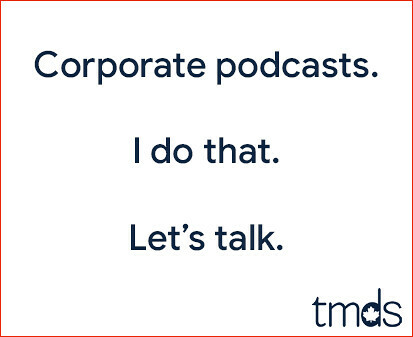 Then have representatives from each company come on the podcast. Interview them. Interact with them. Let us hear them. Then open the vote to the listeners. That way, you'll end up with a company who is at least invested in the podcast more than financially. You won't just end up with "The Scummy Bob's Cash-For-Gold Studio". You'll get some extra podcast content out of it. You can have them all on at once, or one per episode as a tryout. Each of those companies with a serious bid at least get a bit of "free" airtime for being a finalist. The listeners also get invested in the process-- more invested in your podcast, more invested in the sponsor. It's like when you had (ah crap username completely slipping my mind) dudeface from Palma Pasta on. It wasn't just a company giving you money to say their name. He was an actual human being who was a neat guest with interesting stories-- and he just happened to also have a company name to mention. His stories weren't about the company. Sidenote: If you don't get bidders, or are looking for additional revenue streams, most podcasts I hear are sponsored by Audible, the ebook website. Don't know the exact details, but I take it you get a cut of the referral revenue for when people sign up for accounts. Plus, from what I hear from talking to a couple of the podcasters, they have some nice people working there, and have been known to help out with new equipment. I don't think I've had Il Duce on the podcast yet. I talked to him the other day and he's promised to come on because he wants to tell his "Toronto Mike story". Now that you mention it, Palma Pasta Studios has a nice ring to it.. This is probably the episode I anticipated the most b/c the whole Brian Burke saga intrigues me. It's a fascinating view into how his mind works and it just seems so Brian Burke to me. I wanted to hear you talk about it, and you didn't disappoint. Like Argie wrote, you've got a pair of balls on ya. I respect that. @Mike: I guess I should go back and re-listen, one of the guests had an great bunch of stories. Also apologies, I meant "ah crap, I forgot his username", not "I forget what his crappy stupid dumb username is". Il Duce is a perfectly cromulant username! Lorne, I believe you're thinking of Elvis. Gotta disagree with you guys about texting. It's not the other persons fault you left your ringer on. At night put text notifications on silent. Burkes lawyers are doing nothing more than flexing their muscle. It's bully tactics nothing more. Whatever happened to Il Duce anyway? @Matt my brother and one of my best friends said the same thing to me today. "Rose, just put your phone on silent at night." Both of these individuals are known to send texts at all hours. Things occur to them, they text me. They don't see it as being the same as calling me. They win, I now turn my phone to silent at night. I never turn it off, because it's so crap, that it's hard to turn back on. I would rather everyone e-mailed me, but neither of those two use e-mail. I've started texting them from my iPad, I don't think they have noticed. I'm getting my new phone this week finally. If Mike isn't in naughty blogger jail, maybe he can show me how to use it next week. I want it to ring with a song. Are people still doing that? Maybe you could turn this into a deal- have a legal firm sponsor the podcast studio. I can make you some hot dog broth for your hunger strike, if you go to internet prison. I wonder if you could go on a hot dog hunger strike. Maybe the Brian Burke jail will serve them on Sunday's for dinner. This topic gave you great material for your podcast, maybe you need some anonymous outrageous posters for the open Mike segment to stir it up for you. My phone is always on vibrate, never understand colleagues in meetings etc. with the audible always going off. Il Duce and I chat all the time, but I talk to his nice persona, Anthony. Il Duce was/is a dink. There are good ring/alert tones out there - zedge is a fun app - but I like to personalize. There's a slick app for ringtones you'll dig. It's called Zedge. Hotdogs. Mmm. Hotdogs chopped up into Kraft Dinner. Extra yum! Street dogs are great, but lately it's been hard to beat Costco dogs. Huge hotdog. The bun is perfectly warmed. And it's only $1.50, with a drink. Not as many good toppings as a street dog, but that's the balance. SO MUCH ABOUT THE HOT DOG IS THE BUN SOFTNESS! It has to be perfect warmed and squishy but not too squishy and not too toasty. All I need is ketchup for a topping. But there has to be ketchup. Yes I love Rosie laugh! I want more Rosie laugh. Never tried this "raw food" stuff. I don't think it has caught up over here. I like raw carrots, does that count? And Mike, I will definitely come to Toronto just to visit you in jail. Will you do a podcast from your cell with your new best friend Bubba? Raw carrots count! The only problem with making raw food is all the chopping and peeling. It is exhausting. And you need to invest in a serious blender to puree things properly. If you are vegan, the raw food thing is great, so many delicious recipes. I like taking the odd cooking class to learn new stuff. although most of the time all I make is toast!